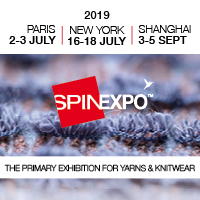 Leading Japanese computerised flat knitting machine manufacturer Shima Seiki will exhibit at the upcoming 12th International Exhibition for Garment, Textile Machinery and Accessories (IGATEX 2019) exhibition, which will be held in Karachi, Pakistan, later this month. On display will be Shima Seiki’s SSR series computerised flat knitting machine. The company aims to assist in modernising Pakistani factories that continue to rely on dependable yet aging older-model Shima Seiki machines with the latest technology. “Featuring industry leading innovations, such as the R2CARRIAGE, spring-type moveable sinker, DSCS Digital Stitch Control System, stitch presser and takedown comb, Made in Japan quality, reliability, productivity, user-friendliness and cost-performance combine to satisfy the high expectations of the world’s fashion industry,” the company reports. Demonstrations will be performed on the SDS-ONE APEX3 design system that is at the core of the Shima Seiki’s Total Knitting System concept. With comprehensive support of the knit supply chain, APEX3 integrates knit production into one smooth and efficient workflow from planning and design to machine programming, production and even sales promotion. Photorealistic simulation capability allows for Virtual Sampling to minimise the need for actual sample-making, effectively reducing time, material and cost while increasing presentation quality in the sampling process. APEX3 also supports design and simulation in a variety of other industries in addition to flat knitting such as circular knitting, weaving, pile weaving and printing.